ST. GEORGE, UT – The Salt Lake Community College softball team experienced the highs and lows of the NJCAA National Championships. Saturday proved to be a busy day of action for the Bruins, starting with the play-in game against Pima Community College. With a win, Salt Lake would have the opportunity to get revenge against Wallace State in the finals. The SLCC softball team rallied back from a loss to Wallace State Friday night to survive a play-in game against Pima College Saturday morning in a contest that lasted 12 innings and nearly three hours. Malia Campos made the critical play at the plate in the 12th inning, knocking in four RBIs with an inside-the-park grand slam. MaCauley Flint pitched a complete game, throwing 181 pitches. Flint gave up five runs on seven hits while striking out five and walking two. The Bruins took care of Wallace State in the first game of the NJCAA National Championships, led by a strong pitching performance by Kailey Christensen. Christensen threw a complete-game shutout, allowing just four hits and one walk while striking out three Lion batters in seven innings of work. The freshman needed just 96 pitches to go the distance, throwing 61 strikes. The Bruins scored in the first four innings of the game, giving Christensen plenty of breathing room to work on the Lion hitters. Catcher Susan Duke drove in three RBIs on two hits, Whitney Holt hit a two-run homer and Campos went 2-3 and scored twice. The win gave Salt Lake one more chance to claim the team’s first NJCAA National Championship, facing off against WSC one more time in the second and final championship game Saturday night. The championship quest ended for SLCC in game two against Wallace State. The Bruins struggled in the batter’s box, going 5-21 at the plate. Shortstop Maddy Woodard went 3-4 with a solo home run, and Campos scored two runs. The Lady Lions were able to chase starting pitcher Kailey Christensen from the game, as she gave up two runs on three hits in the second inning. MaCauley Flint relieved Christensen and kept the Bruins in contention until Wallace State scored five runs in the seventh inning. Campos was named the tournament’s Most Outstanding Offensive player, batting .462 for the tournament, scoring 15 runs and collecting 8 RBIs. Flint, Woodard and Holt each earned All-Tournament Team honors. 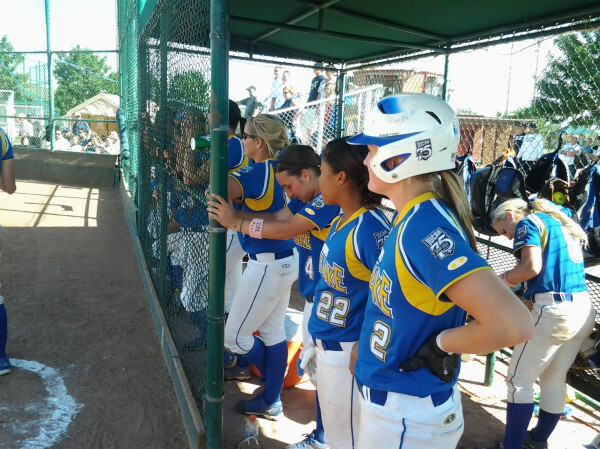 Despite the disappointment of a third consecutive runner-up finish at Nationals, the results prove the Bruins are one of the top junior college softball teams in the country, and Head Coach Mary Kay Amicone and the rest of the coaching staff are capable of recruiting the right players to compete for the championship every year.